About: Presented by Throw Like A Woman, Engaging and empowering strategies, perspectives and informative social impact dialogue with nonprofit innovators. About: Region I members of the National Association of Black Journalists (NABJ) are convening at Penn this spring for their annual conference. Up to 300 journalists, tech pros, students, researchers and educators from across the east coast will travel to Philadelphia to be in attendance. The 23-acre lot where the multi-billion dollar research center sits formerly housed DuPont's Marshall Research Labs is where Penn hopes to break science barriers and raise the national profile of its research initiatives by setting up worthy partnerships. Learn how this project can help advance journalism and where West, Southwest and South Philadelphia communities fit into its plans. I'm interviewing, Lauri Actman, the Chief Operating Officer of the Penn Center for Innovation. About: MEET YOUR MENTOR at the BIZWOMEN MENTORING MONDAY: Join the Philadelphia Business Journal on April 3rd for this one-of-a-kind event that brings together women in a casual, fast-paced coaching atmosphere. The event will offer the opportunity to choose from 40 mentors who are the most influential women in the business community for one-on-one coaching sessions for seven minute conversations. About: The mission of the CU Pitch Competition is to help college students develop their oral communication and public speaking skills to express an idea in a clear, concise, and compelling manner by stating why the topic is important, how they are using a distinctive approach to address it, and what the impact will be if they are successful. My session: The Brand of your Business and You! 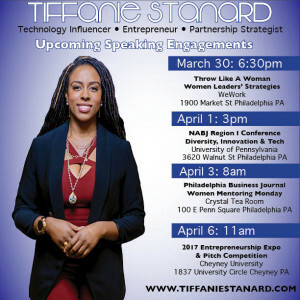 In this talk, Tiffanie shares her journey from branding agency owner, to partnership strategist, to media personality, to tech entrepreneur, to speaker and shows you how you can build your personal brand as you build the brand of your companies. Tiffanie discusses various marketing strategies to showcase how your brand is evolving and steps to present your many passions to the world.